This thread explains how to configure Slartibarty's Hammer + Compile Tools to work for Team Fortress 2. This guide assumes you have already used the stock TF2 Hammer before. You will also need to download the .zip file included with this thread. 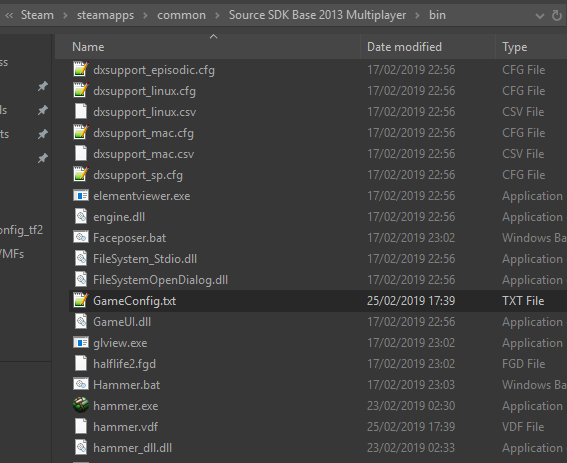 Note: my FGD and the Ultimate Mapping Resource Pack/ABS FGD are merged and bundled with the download, therefore those do not need to be installed again. Next, boot up Slartibarty's Hammer at least once and pick any game if it prompts you to, and when its loaded, close Hammer. If Slartibarty's Hammer crashes or fails to open, you probably didn't install it correctly. Nearly done, now comes the difficult part. You will now need to copy paste the following block into the file. 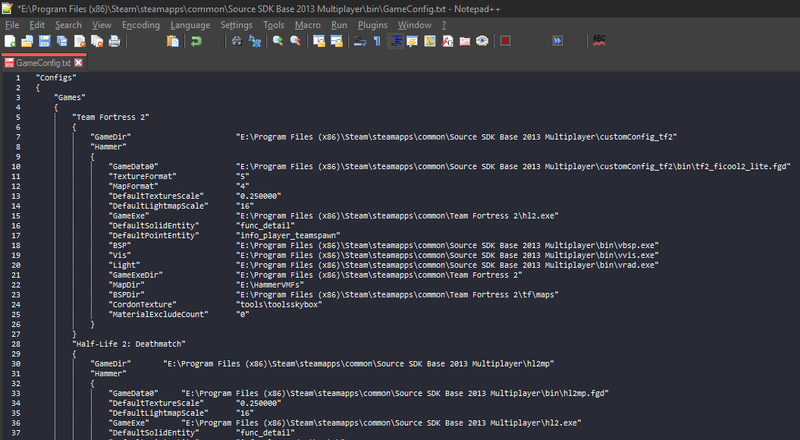 "GameDir" "E:\Program Files (x86)\Steam\steamapps\common\Source SDK Base 2013 Multiplayer\customConfig_tf2"
"GameData0" "E:\Program Files (x86)\Steam\steamapps\common\Source SDK Base 2013 Multiplayer\customConfig_tf2\bin\tf2_ficool2_lite.fgd"
"GameExe" "E:\Program Files (x86)\Steam\steamapps\common\Team Fortress 2\hl2.exe"
"BSP" "E:\Program Files (x86)\Steam\steamapps\common\Source SDK Base 2013 Multiplayer\bin\vbsp.exe"
"Vis" "E:\Program Files (x86)\Steam\steamapps\common\Source SDK Base 2013 Multiplayer\bin\vvis.exe"
"Light" "E:\Program Files (x86)\Steam\steamapps\common\Source SDK Base 2013 Multiplayer\bin\vrad.exe"
"GameExeDir" "E:\Program Files (x86)\Steam\steamapps\common\Team Fortress 2"
"BSPDir" "E:\Program Files (x86)\Steam\steamapps\common\Team Fortress 2\tf\maps"
Now this single line has to be changed. Note: if you know what you are doing, change the other directories below too to save yourself some time for the next sections. If you have no idea what you are doing, then keep following this tutorial. The directory must match the location of the customConfig_tf2 folder you installed earlier. 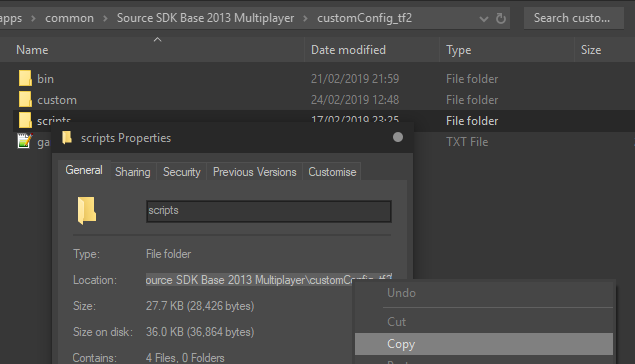 To find this directory easily, navigate to the Source SDK 2013 Multiplayer folder, then into the customConfig_tf2 folder, and then right click on the scripts folder and click Properties. Highlight and copy the entire Location: line. Copy paste this directory into the single line mentioned earlier. Now you can boot up Slartibarty's Hammer. Select the Team Fortress 2 configuration when it starts, and when its finished loading, go to the Tools > Options at the top left. You now have to configure the directories in the Configurations and Build Configs tab. Here is a list of what each one should point to. <dir name> is your root directory, you need to fill this in for each one yourself. Important! Make sure not to choose TF2's BSP/VIS/RAD executeables here. Now you are done. Restart Hammer, and it should be ready to go for mapping. If you use CompilePal, I recommend getting this file as well. An updated FGD to help you map EVEN MORE efficiently.